The picture in this page is a good example of the power of SwaN-MR. 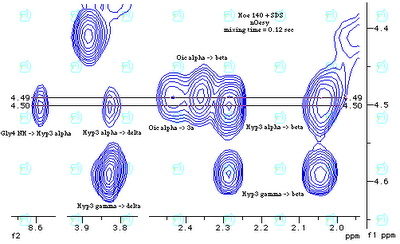 It demonstrates that the peak on the left should be assigned to residue no. 3 (Hyp) instead of no. 8 (Oic) as erroneously published on J. Am. Chem. Soc. 1994, 116, 7532-7540. One may object that I unmasked the error because I acquired the spectrum again and not because of SwaN-MR. If this is true, it is also true that SwaN-MR gave me a simple and elegant way to demonstrate my thesis. By the way: generating the above gif image has also been incredibly simple with SwaN-MR. The whole work was done on a Quadra 610 upgraded to the PowerPC. an interesting picture located at http://qobrue.usc.es/jsgroup/Swan/ Found this more accidentally. Nevertheless this isn't correct in the manner described. Of course you are unfortunately right concerning the misassignment (as stated few years ago). But this was no problem concerning the spectra quality but a change of the substance between the acquisition of the spectra for assignment purposes and the NOESY spectrum. Dear Rainer Haessner, I wish you can tell the whole story on your own blog, maybe when Kessler's reaction can no more affect your career.